I posted this recipe a while ago, along with my late Grandma Minall’s Sugar Shortbread cookies, but I have decided to split them up as well. I don’t think this is her exact recipe, but it was very close to the ones she used to make and my mom always made these for my dad for a little taste of home. I only wish I had lived closer to her so she could have taught me how to make pie as good as her. That incredible woman made a pie every week in her good days – that’s a lot of work! My Grammie passed away in fall 2016 so I hope that people can keep making these cookies in honour of her. 1) In a large mixing bowl, cream butter and sugar until smooth. 2) Add dry ingredients, one cup at a time, scraping down the sides after each addition. 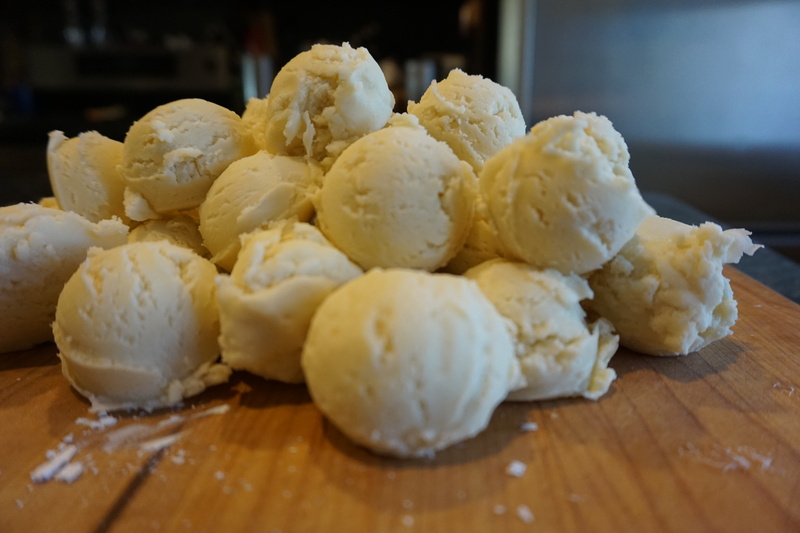 3) Roll into one tsp balls and place on an un-greased cookie sheet (see below if you’re OCD like me and want perfect sizing). 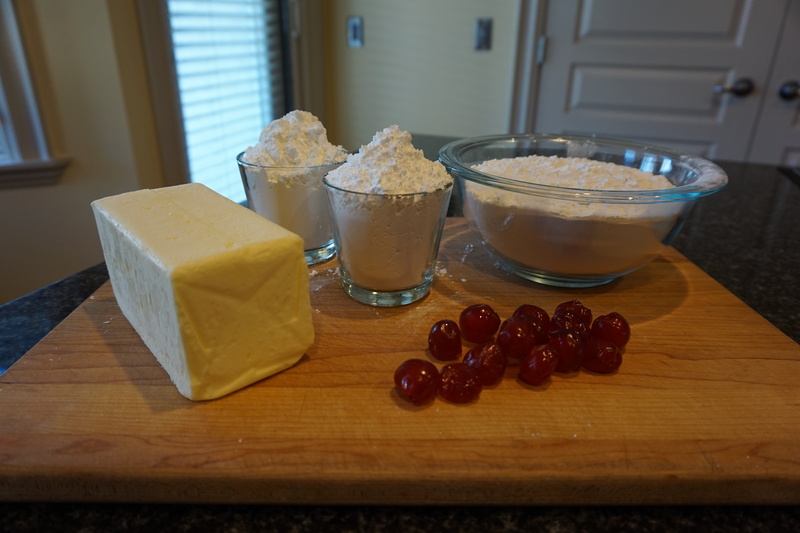 4) Flatten lightly with a floured fork or spoon and top with a piece of cherry. 5) Bake at 350 degrees Fahrenheit for 10-12 minutes. 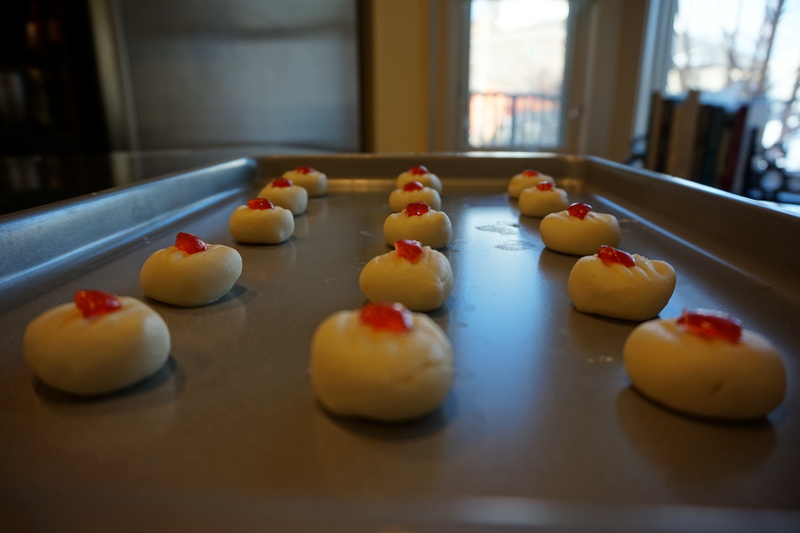 You have to watch these close, and adjust the time based on your oven, as you only want them lightly golden on the bottoms. Portion with a cookie scoop for consistently sized cookies. I cut these each in half before rolling for nice small cookies. Enjoy – these freeze great for up to one month.